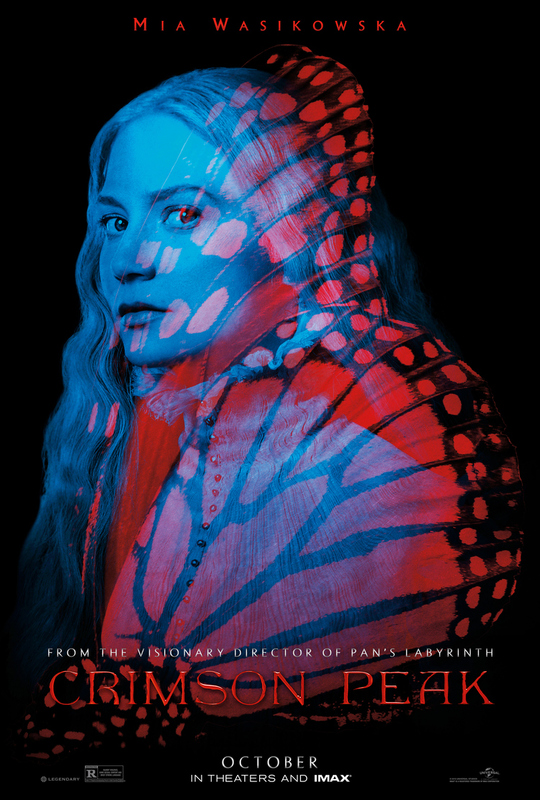 Crimson Peak is the latest film from cult film director Guillermo del Toro, who has created such genre tentpoles as Pacific Rim, Hellboy and Blade II. His latest outing is an original ghost story set in the early 1900s New England. Mia Wasikowska stars as Edith Cushing, a young author and daughter of a successful construction magnate. Her life is turned upside down when mysterious man played by Tom Hiddleston lobbies her father for a investment in a clay mining operation. Hiddleston's character Sir Thomas Sharpe eventually woos Edith and takes her back to his dilapidated estate, located on a mountain of blood red clay. Edith has always been fond of writing ghost stories, much to the dismay of editors who expect love stories from female writers. Being sensitive to paranormal activities, Edith's new locale seems straight out of one of her stories. Jessica Chastain plays Sir Thomas' sister Lucille, whose motives are even more opaque than her brother's. First and foremost, Crimson Peak is a beautiful film. It's absolutely gorgeous. Every rickety staircase and flickering candle is placed with the precision of a painter. The story, however, doesn't have the same level of quality control. It's clear del Toro loves literary and movie monsters. He never quite seems in control of the material in Crimson Peak though, as it careens from love story, to ghost story to Victorian soap opera. Then… the final act rolls in, and is filled with pulpy plot twists and a few intense set pieces that finally deliver on the promises set up in the film's premise. A main character’s broken leg mysteriously heals during this act, though in a movie full of ghosts and blood soaked clay, that perhaps is nitpicking. The level of enjoyment one will get out of the film will likely be proportional to his or her appreciation for classic horror and science fiction stories. Likewise, those who appreciate del Toro's films to date will likely get a kick out of this one. As standalone though, Crimson Peak doesn't quite hold up on it's own merits despite beautiful cinematography.